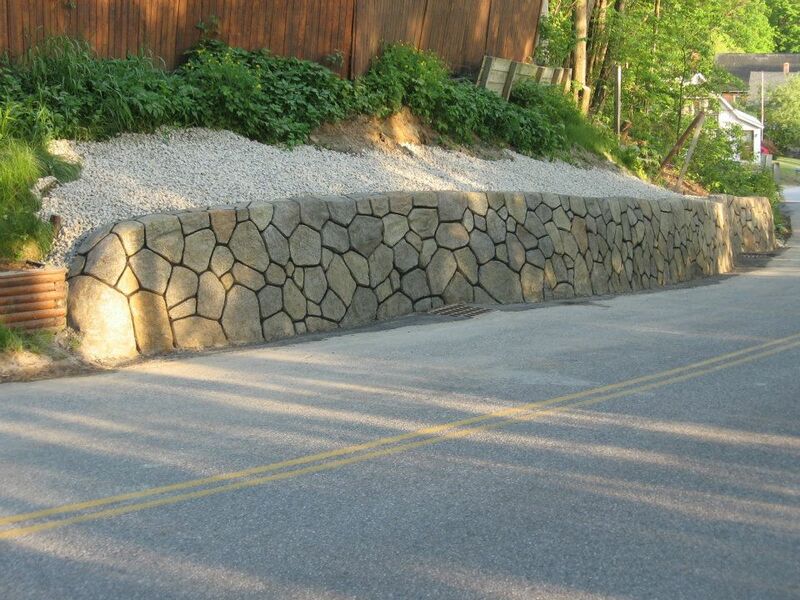 Retaining walls are popular in Southern New Hampshire because of our unpredictable terrain. They are used for a variety of reasons from helping with drainage issues to creating additional area to decorative additions to an outdoor space. There are lots of fashionable retaining wall blocks out there today. We can practically match the color of your house! Straight or curved, new looking or old, concrete block or natural wallstone – we can find a style that fits your unique landscape. As impressive as the face of a creative wall project is, the test of a well-built wall lies in what’s behind it. New England soils tend to have a clay/loam structure to them. These flat particles form what is called “slip planes.” As water travels along these slip planes, it pulls the top layer of soil with it. This is what we see happening in a landslide. These forces of nature are at work behind your attractive retaining wall. If that water runoff has not been dealt with in the construction process, the result can be disastrous. It can be hard to track down the contractor who built it after the wall fails. If the contractor responds, it is their warranty policy that determines who pays for the repair. We take retaining walls seriously. Before we can build your dreamscape, we often have to level it. A pre-construction inspection tells us what type of soil you have. If the soil behind the wall is heavy clay, we can plan ahead to take extra precautions to redirect the water or reinforce the soil to break up those slip planes before they put pressure on the wall we build for you.